In this paper the concept of teacher development is well examined, and theories pertaining to it are also linked to. There are some important terms that need clarification and defining before the concept is explored in deep. The reasons why some terms are worth clarifying is the need for shared understanding. The absence of shared (common) understanding threatens construct validity, and difficulty in identifying teacher development process. Development is a process that involves change from a primitive state to a more advanced one. The United Nations Development Programme uses a more detailed definition and according to them development is to lead long and healthy lives, to be knowledgeable, to have access to the resources needed for a decent standard of living and to be able to participate in the life of the community. Human development can be viewed as freeing people from obstacles that affect their ability to develop their own lives and communities. Development is about empowerment, it is about people taking control of their own lives, expressing their own demands and finding their own solutions to their problems Teacher development is a process whereby teachers’ professionality and/or professionalism may be considered to be enhanced (Evans, 2002). This is to say that the process of teacher development is about both the status and attitude towards the profession. Professionalism is about the status of the profession and in this regard it is about developing teachers’ status professionally. Professionality is about the attitude towards the profession and in this regard it is about developing positive attitude towards it. Evans (2002) asserts that teacher development process may enhance the status of the profession as a whole and improve teachers’ knowledge, skills, and practice. A profession refers to an occupation that requires specialised education, knowledge, training and ethics whose members earn their living from what they do and are expected to meet and maintain common standards (WiseGeek, 2012). Generally a profession is an occupation, vocation and/or high status career usually involving prolonged academic training, formal qualification and/or membership of a profession or regulatory body. The teaching profession not only ought to have the qualities but also strive to maintain them. Teacher professional development is the acquisition of different perspectives and ideas, and the incorporation of a wider vision of what teaching involves (Evans, 2002). Koda (2006) defined teachers’ professional development as one component of school improvement involving teachers seeking guidance through strategies such as clinical supervision. Generally professional development for teachers is the process whereby teachers upgrade and improve their practices whose end is not pre-determined. - A theory should be able to explain observable factors relating to a particular problem. - A theory should be consistent with observable facts and with the already established body of knowledge. - A theory should provide means for its verification. - A theory should stimulate new discoveries and indicate further areas in need of investigation. In teacher development, theories of learning are of concern. This is because in the teaching profession much of the practice and development in the field borrow ideas from learning theories. Learning is an enduring change in behaviour, or the capacity to behave in a given fashion which results from practice or other forms of experience (Chunk, 2012). Learning can also be looked at as a relative permanent change of behaviour as a result of experience. 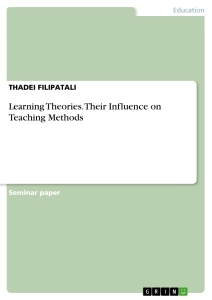 Learning theories are theories whose main concern is to link research with education. In other words learning theories explain how learning and teaching processes should be and/or should take place. As teachers deal with teaching and of equal importance learning of students, the contribution of various learning theories to teacher development is with some detail given hereunder. Although theories differ in many ways, including their general assumptions and guiding principles, many rest on a common foundation. These theories differ in how they predict that learning occurs—in the processes of learning—and in what aspects of learning they stress. Thus, some theories are oriented more toward basic learning and others toward applied learning and, within that, in different content areas; some stress the role of development, others are strongly linked with instruction; and some emphasize motivation. Behavioural learning theories view learning as change in rate/frequency of occurrence, or form of behaviour or response which occurs primarily as a function of environmental factors (Chunk, 2012). They also contend that learning involves the formation of associations between stimuli and responses. Behaviourists explain learning in terms of observable phenomena, and reinforcing consequences make the response more likely to occur whereas punishing consequences make it less likely. The role of environment specifically how stimuli are arranged and presented and how responses are reinforced are of most important. Motivation is the process whereby goal-directed activities are instigated and sustained. As environment properly arranged help learning to occur, teachers should prepare the environment that will help learners to learn such as arranging activities that suit environment. Teachers also need to help learners make practice of what they have learned. This is important as learning is subject to the rate of occurrence of behaviour. The practicing is important for strengthening the responses. Learning should be reinforced. Students should therefore be given rewards. Teachers are to reward any desired behaviour in learning. However to weaken the undesired behaviour learned, teachers should apply punishment. In developing the profession of teaching, teachers have to note that developing professionally has some benefits such as being able to help learners learn. Increasing the knowledge base, being rewarded economically and developing/improving their personal lives. This is to say teachers plan to develop professionally due to these observable benefits as well. Cognitive learning theorists stress the acquisition of knowledge and skills, formation of mental structures and processing of information and beliefs (Chunk, 2012). To cognitivists, learning is an internal mental phenomenon inferred from what people say and do. They contend that learning best takes place by doing it (Aggarwal, 1994). Cognitivists acknowledge the role of environmental conditions as influences on learning, but teachers’ explanations and demonstrations of concepts serve as environmental inputs for students. Practice of skills and correct feedback as needed promote learning. What students do with information, how they attend to, rehearse, transform, code, store, and retrieve is critically important. In general cognitivists suggest that learning takes place in the mind as is a result of mental processes on the information received. Teachers should organise the teaching materials in a way that the concept in them can easily be acquired and processed by learners’ mind. Teachers need to use variety of teaching techniques. This helps teachers lead students to explore the concepts from different angels. Observational learning by Albert Bandura suggests that students learn by observing. Teachers therefore need to be role models to their students. Current learning builds upon the previous one. Teachers therefore should seek for students’ prior knowledge before they launch new concepts. Teachers need to provide exercises and practices to the learners. This is because students learn best in the course of doing exercises. Exercises help to accommodate the information into the mind. Courses and topics should be divided into subparts which can easily be understood by students. The small parts should be taught in such a way that they reinforce each other. This theory was put forward by Jean Piaget whose study focused on the development of children understanding. He did this through observing them while talking and performing different activities. His view was on how children`s minds work and develop has contributed a lot in education. His particular insight was on the role of maturation in increasing capacity of children to understand their world. It was recognized that, children cannot undertake certain tasks until they are psychologically mature enough to do so (Atherton, 2011). - Conservation: The realization that objects or sets of objects stay the same even when they are changed about or made to look different. - Egocentrism: the belief that you are the centre of the universe and everything revolves around. - Schema (or scheme): The representation in the mind of a set of perceptions, ideas, And /or actions, which go together (Atherton, 2011). Jean Piaget believed that humans learn through the construction of one logical structure after another. He also concluded that the logic of children and their modes of thinking are initially entirely different from those of adults. - A teacher's planning should provide opportunities for both learner and teacher to obtain and use information about progress towards learning goals. It also has to be flexible to respond to initial and emerging ideas and skills. Planning should include strategies like; how learners will receive feedback, how they will take part in assessing their learning and how they will be helped to make further progress to ensure that learners understand the goals they are pursuing and the criteria that will be applied in assessing their work (alternative assessment). - In teaching and learning teachers should treat students according to their level of maturity .This will enable learners to impart knowledge and skills compatible to their understanding ability. For example our education system in Tanzania is 2-7-4-2-3+ .where 2 stands for preschool education, 7 stands for primary education, 4 stands for ordinary level secondary education, 2 stands for advanced level secondary education and 3+ stands for tertiary education respectively (MoEVT, 1995).This structure also reflects also the age of learners for example preschool children can start at the age of 5-6 years the time where their is rapid language development. Teachers of this level do so to meet this objective. Constructivism is a theory of knowledge with roots in philosophy, and psychology. The founders of this theory are : Vygotsky, Brunner and John Dewey, they believe that (1) knowledge is not passively received but actively built up by the cognizing subject; (2) the function of cognition is adaptive and serves the organization of the experiential world . In other words, "learning involves constructing one's own knowledge from one's own experiences." Constructivist learning, therefore, is a very personal endeavor, where by internalized concepts, rules, and general principles may consequently be applied in a practical real-world context. Meaning that humans generate knowledge and meaning from an interaction between their experiences and their ideas i.e. students will learn best by trying to make sense of something on their own with the teacher as a guide to help them along the way. Power on: This is a traditional approach of instruction where the teacher teaches and he/ then allows students to construct new knowledge post teaching process. Power of: This is also a traditional approach of instruction where the teacher ignores learning opportunities in the course of teaching but students are told to take note of them to be explored post learning process. Power for: This is a democratic approach of teaching where the learner is freer to explore physical environment so as to solve some problems and create new knowledge. (ii) Elicitation: Helping children become aware of their prior knowledge so that teacher can know student range of ideas. (iii) Restructuring ideas: Helping children become aware of an alternative point of view these goes together with modifying, replacing or extending views. The theory has far-reaching consequences for cognitive development and learning as well as for the practice of teaching in schools. - Constructivism views each learner as a unique individual with unique needs and complex backgrounds, teacher must help these students to attain their goals. - Learners are challenged within close proximity to their current level of development. By experiencing the successful completion of challenging tasks, learners gain confidence and motivation to embark on more complex challenges Vygotsky call it as zone of proximal development(ZPD) (Vygotsky, 1978). Teachers should encourage and accept student autonomy and initiative. They should try to use raw data and primary sources, in addition to manipulative, interactive, and physical materials. So that students are put in situations that might challenge their previous conceptions and that will create contradictions that will encourage discussion among them. In our teaching therefore we need to use some activities which originate from our environment so that learning can be meaningful to students. - Constructivist approach insists that instructors/ facilitator must help the learner to get to his or her own understanding of the content i.e. teacher should encourage student critical thinking and inquiry by asking them thoughtful, open-ended questions, and encourage them to ask questions to each other. So that students can construct their own meaning when learning (Hawkins1994). This is a stage, where the learner receives the information through senses and stores it in a short tem memory. At this point the information stays for only a fraction of a second; this is because this region is continuously bombarded by information which tends to replace the first information (Shunk,1994). The information registered at (SR) is then shunted to the short term memory, where its storage at this region is facilitated by process called chunking and rehearsal. Information here stays for not more than twenty seconds. If chunking and rehearsing does not occur within 20 seconds then the information will lapse. This region has an ability of storing seven plus or minus two units of information. In order for the information to be available in a long term memory it must be transferred from short term memory to long term memory by a process called encoding. At this point the new knowledge is related to the prior knowledge stored in long term memory resulting into persistence and meaningful learning by a process called spreading activation. Mental structures called schema are involved in storage, organization and aiding of retrieval of information. Met cognition is an awareness of structures and the process involved (Bigus, 2011). - The theory also shows that curriculum should be organized in such a way that the sequence of materials reflects the notion of repetition so that the content at one level is built on the basis of the previous one. - The theory also stipulates the kind of knowledge and the way learners can inculcate them .These are procedural knowledge and declarative. Where it is known that procedural knowledge needs more emphasis and time than declarative knowledge. The founder of the theory is Albert Bandura who used the term social learning or observational learning to describe this theory of learning. He believes that learning is essentially a human activity and every person‘s experience. Learning can be due to incidental social interaction and observation. Learning occurs through imitational and modeling while one observes others. The behavior of the teacher has more influence to learners because learner will imitate the behavior of the teacher regardless of whether is good or bad (Omari, 2006). b. Learning which lead to acquiring personal emotional and satisfaction e.g. imitating some body‘s style of dressing, talking, acting etc. c. Teacher must plan teaching materials which help student to develop individual skills and unlearn what is not good which was learned some time ago e.g. during child hood time. In general theories of learning help teachers in many ways while developing the curriculum, these theories help teachers in Grade placement for objectives which are educationally attainable, Tyler (1949), use educational psychology to filter/screen the curriculum objectives before it is used in planning of the curriculum, suggestion of time i.e. age/level required to attain certain educational objective and at which it is appropriate to teach certain content. Teacher use educational learning theories in solving some psychological problem for their students like using punishment, psychology of learning help instructor in deciding the nature of learning and how to achieve it when planning for teaching and learning process. Aggarwal, J. C. (2004). Essentials of Educational Psychology: (6th Edition). Delhi: Vikas Publishing House PVT. Ary, D., Jacobs, L. C. and Sorensen, C (2010). Introduction to Research in Education. Belmont, CA, USA: Wadsworth. Bell,B .(1993). Taking into account students` thinking :A teacher development guide .Hamilton: Center for Mathematics and Sciences Education, University of Waikato. Bigus,J (2011) Reflection on Behaviorism New York :Harper Collins. Chunk, D. H. (2012). Learning Theories: An Educational Perspective. (6th Edition). Boston. Pearson Education, Inc. Hawkins,D. (1994) Constructivism: London, Falmer Press. Schunk, D. H. (1994). Self-efficacy and education and instruction. In J. E. Maddux (Ed. ), Self- efficacy,adaptation, and adjustment: Theory, research, and application. Vol 3 pp. 281–303. Tyler, R. W. (1949). Basic principles of curriculum and instruction: Chicago: University of Chicago press. Developing an Innovative Teaching Concept: "Hidden Champions. Departure to Globalia"